Jermain Defoe scored twice and Doneil Henry had the winner in injury time as the hometown Toronto FC clipped the Columbus Crew, 3-2 at BMO Field on Saturday. 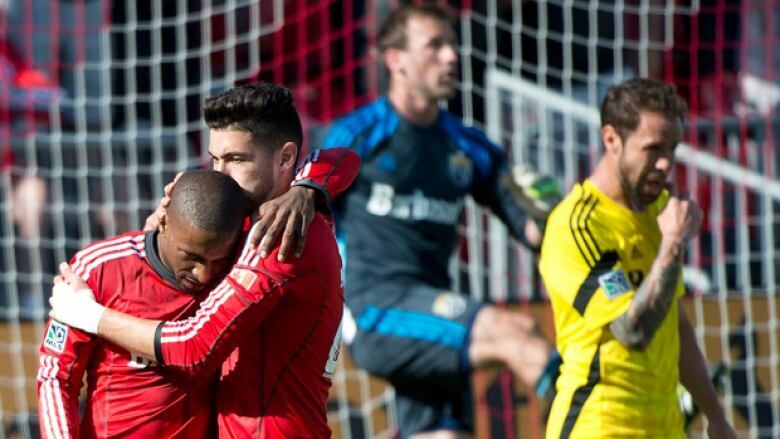 Toronto FC used to be known for its heartbreaking tendency to give up goals in the dying seconds. Doneil Henry, the man who scored Toronto FC's last-gasp game winner Saturday, knows that probably better than anyone. Jermain Defoe scored twice and Henry, who has seen plenty of heartbreak in his more than four seasons with TFC, headed in the third in injury time to lift Toronto to a 3-2 Major League Soccer victory over the Columbus Crew. "It's the guys that we have in this locker room, we have some really bold characters, some guys that really will die for the game," Henry said. "That's been the difference maker. "And we all believe in our coach, we all will stick up and die for this coach, for Ryan Nelsen. So when you think of opportunities of winning games and trying to finally bring the playoffs to Toronto, you think of the guys in this change room." Defoe, the former Tottenham Hotspurs star and biggest name in Toronto's much-celebrated off-season signing spree, scored on a penalty shot. He then added a second when Brazilian striker Gilberto headed the ball onto the Englishman, and he one-timed a beautiful strike past Crew 'keeper Steve Clark. The 21-year-old Henry, however, was the star of the afternoon. The 6-foot-2 defender from Brampton, Ont., muscled his way in on a free kick from Daniel Lovitz with about a minute left to play to score with a glancing header. It was his second goal in as many games — Henry scored in Wednesday's 1-1 draw with Montreal — and another plus for the player who's rebounded from a couple of minuses. "In your career, when you have your negative days, you can either let it eat you and be a timid person or you can stand up like a man and just embrace it and just try to better yourself and understand the game better," said Henry, who ripped off his shirt while his teammates mobbed him. Henry had been making news more for the goals that cost his team — most recently in Toronto's 2-2 draw at Sporting Kansas City a week earlier, Henry's foul inside the box cost the team a Kansas City penalty shot. Nelsen is proud of how Henry has played this week. "He's got amazing athleticism, he's got lovely spring, he's a good timer of hitting the ball," Nelsen said. "It's just reward for being brave and trying to make an impact in the game and not letting the game go by and then look in the mirror at night and think 'God, I wish I'd made that run,' as we've all done. "You've got to be brave, you've got to put yourself in the arena and he did. He went for it and he got his reward by helping us win this game." The goal boosted Toronto's record to 5-4-1 and sent the 22,591 fans at a sun-drenched BMO Field home happy. Justin Meram and Augustin Viana scored for Columbus (4-5-4). Meram put Columbus on the scoreboard in the 18th minute — several nice passes by the Crew found Meram alone just outside the top of the 18-yard-box, and he fired a shot past Toronto goalkeeper Joe Bendik. Defoe, who said he felt fresh from sitting out Wednesday's game against Montreal, converted a penalty three minutes later to tie the game after he was pulled down in the box by Tyson Wahl. "The last two games, we haven't been at our best, but we've gotten results," Defoe said. "Great character to come back and win the game. "It's not an easy thing to do. It was all about character again." Viana put the Crew ahead 2-1 in the 65th minute when he headed in a corner kick from the top of the six-yard-box, sneaking the ball just inside the right post. The goals were the only decent shots on target all afternoon. The Crew were more accurate with their passing and held a slight edge in possession. "Even though we didn't play that well, we stayed in the game, we kept trying ... sometimes, it was painful to watch," Nelsen said. "The boys kept going, they never backed out. "Even the best teams in the world have really bad days in the office, but if you're still trying to do the good things ... a lot of the times you get rewarded." Gilberto, the Brazilian striker and designated player that was also part of Toronto's off-season rebuild, started on the bench for the first time with the team. Nelsen said Gilberto wasn't feeling well on Thursday and Friday and gave Luke Moore the start in his place. Gilberto replaced Jackson in the 65th minute, and had a shot on his first touch, but launched it well over the Columbus net. He would have fans cheering, though, with his ball to Defoe on the second goal. "As soon as it came to [Gilberto], I knew he was going to head it on so I could just turn," Defoe said of the goal. "As soon as I turned I thought, this is the chance, you've got to just hit it as quick as you can. It was one of them goals when, as soon as I made contact, I knew it was going in." Toronto was awarded the Trillium Cup — the cup competition between these two teams — afterward. TFC had won the first game of the matchup 2-0 in April in Columbus. Both teams were playing without their captains — Toronto's centre back Steven Caldwell was serving a suspension for his red card in TFC's 2-2 draw at Kansas City a week earlier, while Columbus was missing forward Frederico Higuain to a suspension. Toronto has only beaten Columbus four times in the 21 meetings between the two teams. Seven of the games have resulted in ties. Toronto has only beaten the Crew twice at BMO Field in 10 matchups. TFC travels to Montreal on Wednesday for the second leg of the Amway Canadian Championship, which doesn't count toward MLS standings. They're back in Toronto next Saturday against the San Jose Earthquakes.